The Oleaster Family East of the Cascade Mts. Russian Olive, Oleaster: Elaeagnus angustifolia - Fragrant trees with silvery foliage and drupe-like fruits. Leaves and branches alternate. flowers bisexual with 4 stamens. Often found below 1400 meters around homesteads or along watercourses. 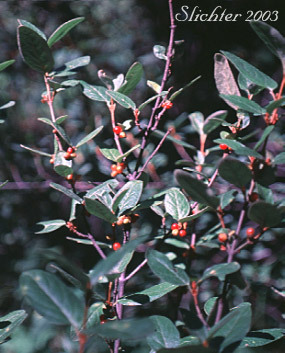 Buffalo Berry: The Genus Shepherdia - Shrubs. Leaves and branches opposite. Flowers unisexual with the staminate flowers on different plants than the pistillate plants. 8 stamens found on staminate flowers.